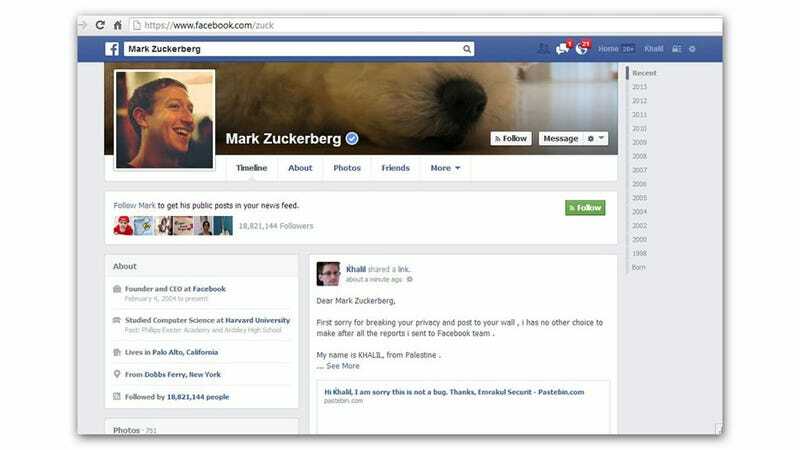 Khalil, a Palestinian white hat hacker, submitted bug reports to Facebook about a vulnerability that allowed him to post on anyone's wall. But Facebook's security team didn't do anything. So Khalil wrote on Mark Zuckerberg’s wall about it and was generally a badass. Khalil explains on his blog that he submitted a full description of the bug, plus follow-up proof of its existence to the Facebook security feedback page, where researchers can win rewards of at least $500 for finding significant vulnerabilities. Then he submitted again. The second time he got an e-mail back that said, "I am sorry this is not a bug." When he posted on Zuckerberg's wall, Khalil said, "First sorry for breaking your privacy and post to your wall , i has no other choice to make after all the reports i sent to Facebook team ." He then detailed the situation and provided links.